A previously undiscovered method of image making dating from the 1820s may force a re-write of the photographic history books, claim researchers. 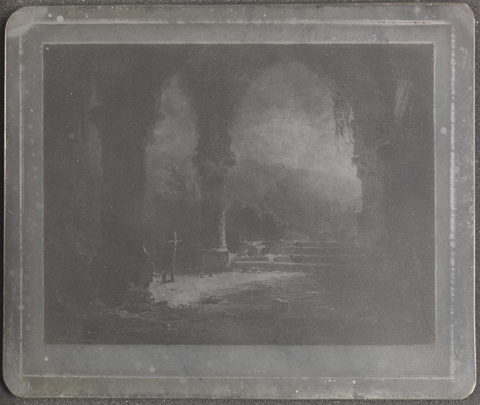 The findings stem from analysis of a photographic plate created by French amateur scientist Joseph Nicéphore Niépce which was brought to England in 1827. Though the findings do not reveal a previously unknown photograph, they appear to shed new light on the processes used to fix a photographic image, and Niépce’s role in the recorded invention of photography, as we know it, in 1839. Scientists point to the possibility that Niépce kept secret a process where he used a ‘light-solidified’ resin deposit resembling a material obtained when heating lavender oil, to help the plate accept the image. This conflicts with records which suggest Niépce had only used bitumen to coat the pewter plates. The research was conducted by the National Media Museum (NMM) in Bradford and the Getty Conservation Institute in Los Angeles. Scientists examined the image structure present in the metal plates using technology that included infrared spectroscopy to identify the organic components of the image layer. They also used high resolution digital microscopy to reveal details of the image structure. An NMM spokesman said: ?Of the three plates studied, one illustrated Niépce?s skill in copying prints of the day and included deep etching, done by the photographer to enhance the original photograph. ?A second plate showed light etching over a photograph. ‘However the stand out artefact is the third plate, long thought to be enhanced with etching, which is actually a photograph without any hand tooling at all.? This plate, Un Clair de Lune (pictured above), originates from around 1827. The scientists say there is no previous evidence that Niépce’s used lavender oil to help fix his pictures and stress that they found no trace of hand engraving used to enhance them. Amateur Photographer reported the potential implications of this research in August. Niépce is known to have captured the first surviving photograph from nature around 1826. History books record that the Frenchman was not only able to develop the image, he was also able to fix it, having first experimented by copying drawings through the action of light – and subsequent etching – more than a decade earlier. Niépce (pictured) is believed to have contributed to Louis Daguerre’s discovery of the light sensitivity of iodised silver plates in 1831. Daguerre and British inventor William Henry Fox Talbot are regarded as the founding fathers of practical, or ‘modern’, photography in papers they published separately in 1839. Researchers say their investigations provide new evidence of the significance of Niépce’s contribution to the history of photography. ‘Our findings are shining a different light on the early history of photography than has previously been documented in literature,’ said Dusan Stulik, senior scientist at the Getty Conservation Institute. Niépce had intended to share his pioneering experiments to the Royal Society in England in 1827 but he never got the chance. He died in 1833, six years before Daguerre – his sometimes collaborator – made his claim as an inventor of photography. Last year we reported how an amateur photographer used sophisticated computer graphics to controversially claim that a famous 1514 engraving by Albrecht Dürer is actually a photograph of a drawing by Leonardo da Vinci. Welshman Roger Davies also claimed to have uncovered a secret code in the artwork. Davies came up with his theory after scrutinising Melancholia, a famous engraving by renowned German Renaissance artist Albrecht Dürer. However, a prominent expert on Dürer, based at the British Museum, swiftly disputed the claims in an interview with Amateur Photographer.